Over the last years, on many occasions, it has occured to me that there are quite some misunderstandings about what exactly are period or baroque style instruments. It seems to me that still for many people, compared to a modern one, a baroque violin is one with no chinrest, a different tailpeice, a shorter fingerboard, and oh yes... gut strings. A baroque cello is one with no end pin, and so on. These might well be the most visual differences, but surely not the most important ones. The essential difference between baroque and modern instruments, is mostly all a question of tension. Baroque (pre 1750), classical (late 18th cent), and even 19th cent. instruments, all should have less tension than modern ones. How much tension an instrument has, is the result of various factors : it depends on the construction of the neck’s angle, combined with the tension of the strings. Following is a short (simplified) explanation of the evolution of violin construction from 17th cent. till today. On the next page, I shall take a closer look at, and measure, the actual tension on the different period violins. Untill approx. the 2nd half of the 18th century, violins were commonly constructed as shown in Figure 1. This means that the foot of the neck had the same size of the ribs (D on the fig.) and the neck was positioned straight (aligned with the A-B axis on the fig), without inclination. The virtual bridge height (C on the fig,), then is a result of a very tapered fingerboard ; thin near the pegbox, very thick near the body, resulting in a very unequal thickness of the neck-fingerboard combination. Also note that the fingerboard was shorter, not made of ebony wood, but made of lighter woods, often veneered with ebony. The same method was then applied to the tailpiece. This setting results in a low string angle (X on the fig.) on the bridge, consequently giving lower tension on the belly and back of the violin. Therefore, it was not necessary to make a very strong bassbar. This combined with a lower tuning pitch (around 415Hz. and even lower) and the use of lower tension gut strings, explains the lower output of sound, well suited to accompany other period instruments, such as the harpsichord and others. From the 2nd half of the 18th century on, there has been a transition period. 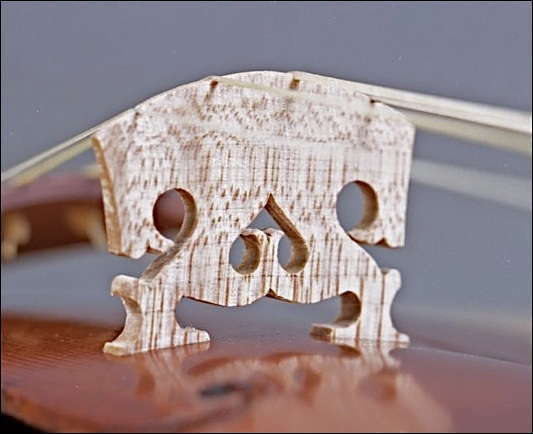 Already violins were constructed to support a higher tension, to give a stronger, more brilliant tone. The evolution of the bows has also been very important in that period, as was the introduction of the pianoforte. Also the pitch went up, today referred to as "Mozart tuning", around 430Hz. was common (or is commonly accepted today). Figure 2 shows a classical (late 18th cent.) construction. To avoid the unequal thick neck-fingerboard combination of the baroque period, the size of the neck’s foot (D on the fig. ), has been increased somewhat. Also the neck has an inclination angle on the A-B axis shown on the figure. A stronger, steeper angle (X on the fig.) was already applied, transmitting more tension to the belly and back. This was balanced by a stronger bassbar, compared to earlier, baroque ones. Of course, the evolution of the instruments was reflecting the evolution of the music (and less so vice versa). Because playing higher positions and using more shifts was more common, a thinner, more equal neck-fingerboard combination made it easier ; fingerboards were made increasingly longer, and also point E, on fig.2, has been cut deeper. This evolution of ever steeper angles and higher tension, has continued through the 19th and 20th centuries (and is still continuing today ! ), to come to the modern violin as we know it today. As shown on fig 3, the foot of the neck (D on the fig), has been made to full height ; the neck’s inclination’s angle has increased even more, with the top nut today aligned or even placed under the A-B axis ; while the bridge height (C on the fig), has also increased. All this results in a much stronger, steeper, string angle (X on the fig), transmitting much more force on the instruments body. A stronger, higher bassbar is required to balance this concept. This combined with different string materials, tuned at a higher pitch (440Hz. ), has led to the strong and brilliant sound of the modern violin as we know today. The construction methods described here, are based on what is known from instruments, survived with their original neck positioning, as well as from a study of iconography, paintings and drawings, and texts written in the 17th and 18th centuries. All this is pointing towards this concept of flatter string angles and lighter bassbars used earlier. Please note that on the figures used on this page, the bridge height (C on the fig), is only the virtual height, a result of the prolongation of the fingerboard. Since the strings on the instrument should be well above the fingerboard, the actual bridge is made higher than the "C" on the figure. This also gives a steeper angle (X) than shown on the figures.